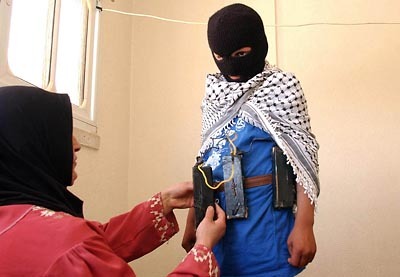 "A Mother's Hands" Om Mohammed helps her twelve-year-old son Abu Ali with a toy suicide bomber belt he fashioned on his own. "I hope to be a Martyr...I hope when I get 14 or 15 to explode myself." His mother is proud of her son: "God gave him to me to protect and defend our homeland." The family is seen in their Gaza City home.